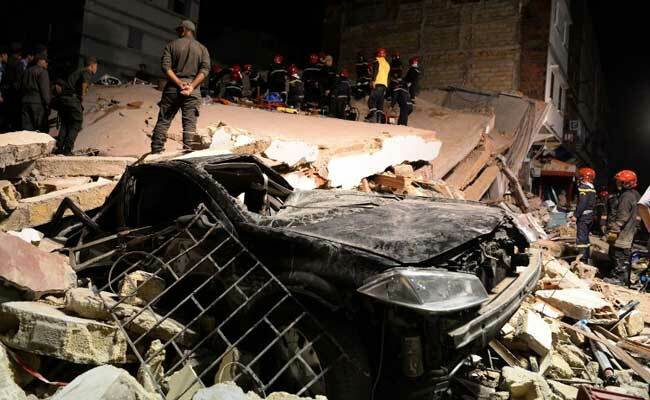 Rescuers today searched for a woman believed trapped under a building that collapsed in Morocco’s economic capital Casablanca, killing two people and injuring 24, officials and witnesses said. The four-storey building in the Sbata district that came down on Friday evening had a cafe on the ground floor that had been teeming with customers and a doctor’s clinic which was also full, witnesses said. A taxi driver who had gone into the cafe to use the restroom was killed, witnesses said. Today, the body of a 13-year-old girl was retrieved from the rubble, they added. A statement from Casablanca municipality confirmed the death of a man and a young girl in the collapse and said another 24 people had been injured. An initial toll late on Friday was one dead. Nine of the injured have now been discharged from hospital but the remainder were still receiving care, the municipality statement said, adding that they were in a stable condition. However, the body of a woman was still trapped under the debris and rescue workers were trying to locate her, said the statement carried by the official MAP news agency. Authorities today arrested the owner of the building for questioning about the causes of the collapse, it added. The royal court said King Mohammed VI had expressed his condolences to the families of the victims and announced that he would pay for their funerals and for the hospital treatment of those injured. Footage from the scene showed the building fully collapsed with what appears to be its concrete roof slanted over the rubble and at least one crushed car. Firemen and rescue workers worked through the night, often having to drill through layers of concrete to be able to free trapped victims. Hundreds of people thronged around the collapsed building, with some climbing on top of the rubble to try to help in the rescue operation. Witnesses said a woman was pulled alive from under the rubble but that her leg had been severed. A local news website said the building had initially had just one floor but that the owner had managed to obtain a permit allowing him to add another three. The new floors were completed only six months ago, reports said. Casablanca is home to five million people, many of whom live in hazardous accommodation, including in the city’s sprawling slums. After a string of building accidents, the housing minister in 2012 said that between 4,000 and 7,000 buildings in the city were at risk of collapse. Two years later 23 people were killed when three buildings collapsed, in one of the worst disasters to hit Casablanca. In February last year, a court jailed seven people over their role in the deaths to between two and five years in prison and fined them for “involuntary homicide” and “breaching urban planning codes”.